In the recent article by Christine Schuy, you have already heard that studying microglia, the brain resident immune cells, is very interdisciplinary. It can therefore be challenging to find conferences that exactly fit this topic, especially if one is looking for an even narrower topic: the role of microglia in Alzheimer’s disease. The Alzheimer’s Association International Conference 2016 in Toronto is the major conference on Alzheimer’s research. Therefore, this conference represented a great opportunity for me to learn about the current progress in Alzheimer’s disease research and to see my own work in a broader context. The huge convention center in Toronto, where the conference took place was already impressive. The welcome session, however, with its live artists was even more stunning. The large number of 5000 participants raised the challenge, how networking between so many unknown international researchers from different research fields can be fostered. 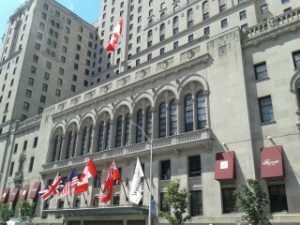 One first informal platform for interaction between the scientists was the welcome reception at the historic Liberty Grand building in Toronto. The event was entitled “Seasons in Ontario”. Each of the four building wings was dedicated to a different season, decorated accordingly and equipped with different theme food buffets and performances. Spring started off with a harp player, echoing the awakening nature. In the summer room, various dance groups performed, representing the diverse cultural scene within multicultural Ontario. In the red, yellow and orange adorned fall room, a vibrant band played. 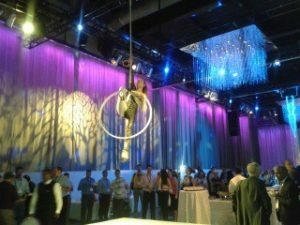 And finally in the winter room, a violinist and a trapeze artist welcomed the visitors in a chilly surrounding. Everyone was free to wander around and it was therefore easy to get in touch with people. This allowed, me for example, to talk to PhD students from the U.S. and young post-docs from England in a very relaxed and informal atmosphere. The conference itself was also very professionally organized including a daily program booklet as well as a great conference App that allowed for easy orientation in the convention center. The decision, which session to attend was sometimes difficult due to up to eight parallel sessions. However, taking it day-by-day, browsing through multiple abstracts in the App and creating my own digital schedule through the App made it much easier. The crowd never felt too big and the poster sessions still allowed personal contact to other PhD students and post-docs. During several conversations in front of posters, I was not only able to talk about the results and aims of the studies, but also to exchange technical and experimental details, that I am sure will benefit my work. I also benefited from the conference’s outstanding focus on young investigators. Different activities and events had been organized especially for young researchers, such as the “Early Career Mentoring Breakfast”, where we could meet experts in the field of neurodegeneration. In a small round, a group of professors gave advise on general career questions and on the benefits of successful mentoring. Furthermore, there was a special, small PhD student and post-doc lounge during the whole time the conference took place, which allowed to escape for some time and to get in contact with other young scientists. Additionally, there were small, special meet-the-expert sessions with some of the invited, plenary speakers. These gave the opportunity to talk to experts of different fields in a relaxed atmosphere. I especially liked meeting Prof. Dr. Gabriella Constantin from the University of Verona after her plenary talk about the role of neutrophils in Alzheimer’s disease. In a small group, I talked to her about details from her own work and possible implications for my own project. In her plenary talk, Prof. Dr. Gabriella Constantin showed that in transgenic mouse models of Alzheimer’s disease neutrophils can invade in the brain parenchyma and that this promotes neuropathology and cognitive dysfunction. The integrin leukocyte function-associated antigen 1 (LFA-1) seems to play an essential role in the neutrophil trafficking, indicating that its inhibition might represent a new therapeutic approach for Alzheimer’s disease. Her invitation as a plenary speaker, showed that a contribution of inflammation and inflammatory cells to Alzheimer’s disease is currently getting more and more attention. For me, someone who works on characterizing and deciphering the role of microglial activation in Alzheimer’s disease, this is great news. Especially after I could see during the conference that strategies for the development of treatments and clinical trials are mainly focused on targeting amyloid-beta directly or its processing by secretases. A similar concern was also raised in the last plenary session entitled “Nexus of Alzheimer’s and Cancer” by Dr. Jane Ann Driver from the Harvard Medical School. She reminded us of the fact that for cancer, there are many properly defined hallmarks such as insensitivity to growth suppressors, induction of angiogenesis evasion of the immune system, and metastasis (Hanahan and Weinberg, Cell 2011). For Alzheimer’s disease, in contrast, there are mainly two properly characterized hallmarks: the extracellular amyloid-beta plaques and the intracellular neurofibrillary tangles consisting of truncated and hyperphosphorylated variants of the tau protein. However, we know that there are far more things that occur in Alzheimer’s disease, some possibly worth being called a hallmark as well. These aspects need to be further studied and characterized, so that it becomes clearer whether they merely correlate with disease status or contribute to its progression. There were already some interesting talks about links of such aspects as deregulation of metabolism, autophagy, mitochondrial bioenergetics, chaperone activity and the contribution of the adaptive immune system to the pathology of Alzheimer’s disease. For example, it was presented that within an Alzheimer’s disease mouse model, regulatory T cells play a beneficial role in the pathophysiology by slowing disease progression and modulation of microglial response to amyloid-beta. As I did not fully appreciate these aspects before, these talks made me look at my specific project from a different angle, which is an important message for me: one should never forget to sometimes step back a bit from a specific research question and look at the broader picture. This will also make it easier to better understand e.g. unexpected results or to approach own research questions from a different side. 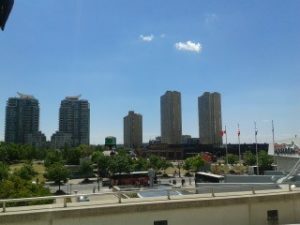 Also because of this last-mentioned aspect, attending the Alzheimer’s Association International Conference in Toronto was an amazing experience for me, which was made possible by the ImmunoSensation Blog Travel grant. In 5 days I could put my own research in a broader context, met many new people and concerning an own scientific future learned, how many different and interesting research areas exist within the broad AD research field.